Excel and grow with document quality, colour. Produce dark blacks, vivid colours – even on uncoated bond – in moisture-, fade-resistant prints. Set a new technical document standard – crisp lines, fine detail, smooth greyscales. HP PageWide XL pigment ink – fast, high-quality printing. Set a new quality standard for technical documents: HP PageWide XL pigment ink for durable prints with crisp lines, fine detail, smooth greyscales that beat LED. Vivid colour at breakthrough speeds – ideal for GIS maps, point-of-sale(POS) posters. Fast colour, excellent document quality. Enabling fast production printing in monochrome and colour, HP PageWide XL pigment ink supports print speeds up to 30 D/A1 pages/minute. 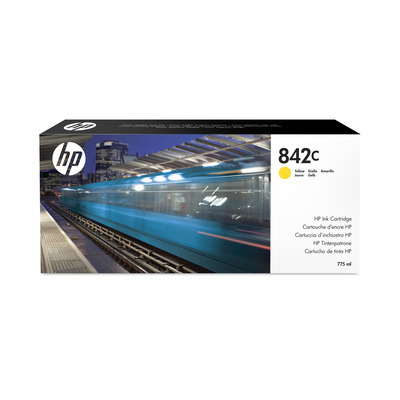 Dual HP ink cartridges enable automatic cartridge switchover while the printer is running. HP PageWide XL pigment ink is designed for single-pass, large-format HP PageWide XL printing, allowing HP PageWide printheads to operate reliably for outstanding sustained, high-quality productivity.